Hello to you dear friend! 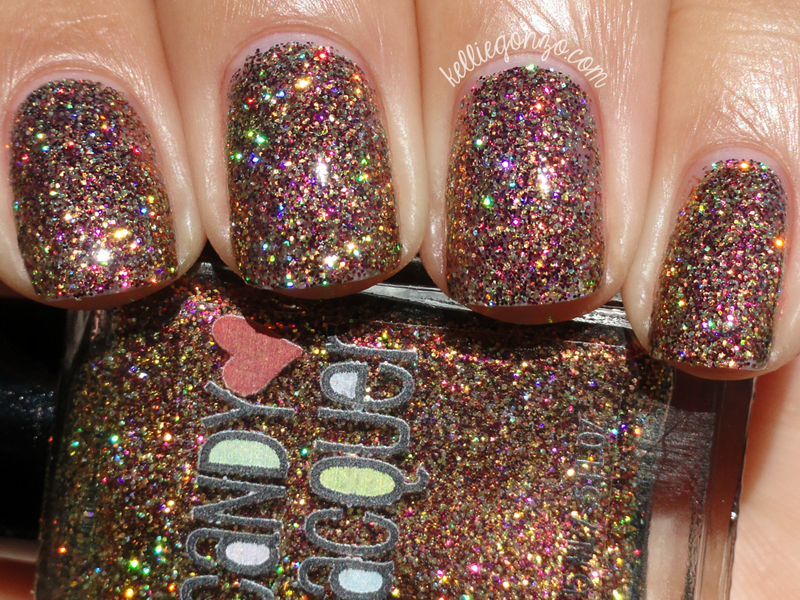 Today I have a really awesome polish to show you from indie brand Candy Lacquer. I love this brand and actually haven't bought anything from them in a while, but when I saw their special holiday glitters for 2014 I had to get one! Are you sick of me showing you holiday polishes in January? Well, sorry 'bout it cuz I have a few more on deck haha. Christmas Donner is part of the Magical Reindeer collection, a 7 piece collection all full of intense glitter. Sadly this is not available in her shop right now but there are a couple with the same finish/glitter type just in different colors, so I figured it was still ok to show you. This one is a mix of gold/green "chameleon" glitters, dark red and super holographic gold glitters, a great combination. The glitter is very dense but it's easy to apply. This is two coats! This was hard to photograph. It's like a billion times better in real life. So like I said, unfortunately this isn't available to purchase but you should still check out the other awesome polishes Candy Lacquer has to purchase because they're awesome. This one I purchased for $12, but her polish ranges from $7-12. She has an Etsy store and a Big Cartel store, not sure what the difference is, but I've ordered from both with no issue. What do you think of this glitter bomb? Have you ever tried Candy Lacquer?